Lacto-ovo vegetarians: eat dairy products (milk, cheese, yoghurt) and eggs but don’t eat any red meat, chicken or seafood. Vegans: don’t eat any animal products including all meats, dairy products, eggs, honey and gelatin). There are also a lot of people who choose not to include red meat or certain other meats in their diet, but may still eat fish. Why do people become vegetarian? Is a vegetarian diet healthier than one that includes meat? The answer to this is both yes and no. Both meat eaters and vegetarians can be healthy or unhealthy. For example a vegetarian who eats a lot of fried foods is still at risk of high cholesterol, obesity, diabetes and heart disease while a meat eater who trims the excess fat off their meat and chooses healthy options like fish can be very healthy. However with a bit of extra planning, vegetarians can enjoy a very nutritious diet full of all the nutrients they need and low in saturated fat that can damage the heart. Am I missing any important nutrients by eating a vegetarian diet? There are certain important nutrients that meat provides such as protein, iron, b-vitamins and zinc that vegetarians can be at risk of deficiency. With the right dietary balance though, vegetarians can get all the nutrients they need from non-meat sources. Protein is important for healthy growth and strong muscles. Vegetarians can get protein from milk, milk products, tofu, nutrela, eggs, legumes, nuts, seeds, breads and cereals. 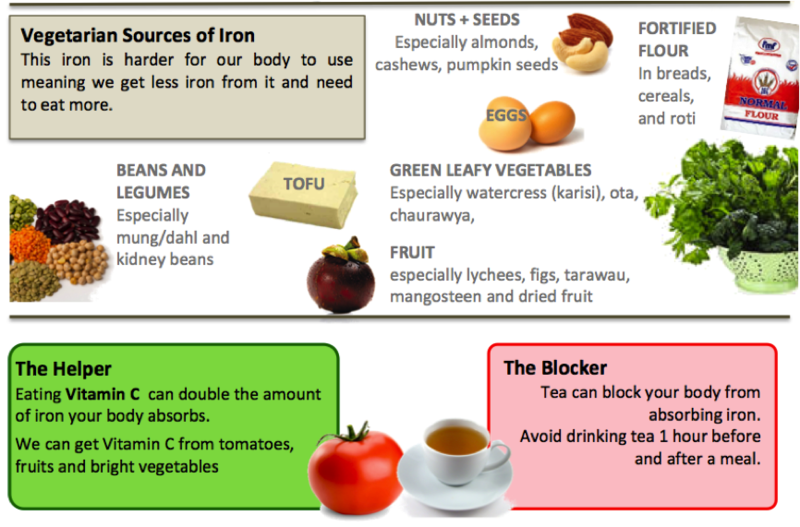 Iron is important for your blood and brain, low iron intake can lead to anaemia which is very common in Fiji and leaves us feeling tired and run down, weakening our immune system. Notice any links? Vegetarians can get both iron and protein from healthy everyday foods. Legumes include beans, peas and lentils such as black eyed peas, blue peas, kidney bean, dhal, peanut, boda, beans (French, long, winged, butter) and chickpeas. 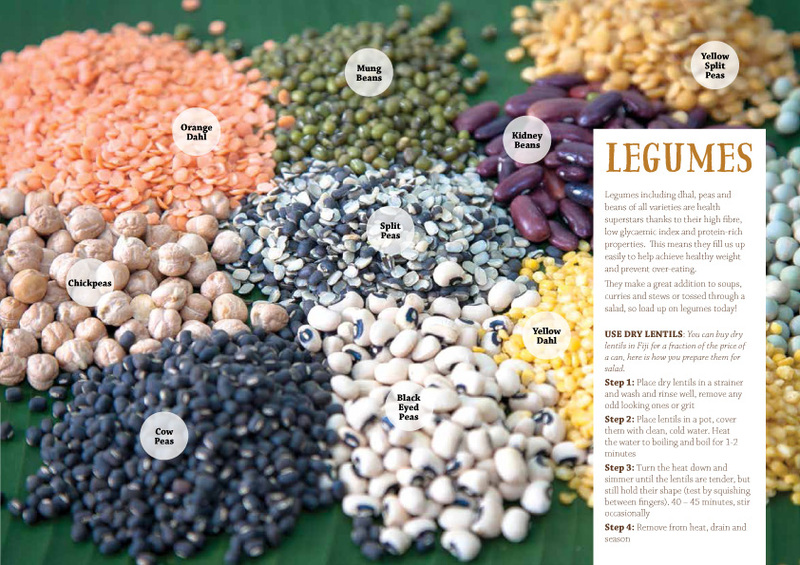 Legumes are rich in fibre and iron making them a great choice for vegetarians. Legumes are very Important for both iron and protein (including cooked dried beans, peas and lentils). Any Vegetarian should ensure the feature regularly in their diet. It’s also important for vegetarians to include dairy products (such as milk, cheese and yoghurt) to get enough calcium in their diets. Calcium is important for strong bones and teeth. If you don’t drink milk, other foods you can get calcium from (in smaller amounts) include wholegrain bread, peanuts, broccoli, spinach, baked beans and tofu. You body needs small quantities of vitamin B12. Vitamin B12 deficiencies can also cause anaemia. If you are a healthy vegetarian, then you should be getting enough vitamin B12 from dairy products. However, there is no natural non-animal source of vitamin B12, so Vegans need to make sure they are getting enough through supplements or injections. Speak to your doctor or pharmacist to find out more. Like adults, vegetarian children need some planning to make sure all their nutrient needs are met. As many vegetarian protein sources, (such as legumes) are bulky, kids can fill up quickly and find it difficult to eat enough. Feeding them small meals often is a good way to keep them fuelled throughout the day. Snacks such as nuts and seeds can help boost their iron and protein. To maximise their iron absorption try to have a bit of vitamin C in all of their meals (such as fruit, tomatoes, chilli’s or cumquat juice) and also discourage them from drinking tea during meals and an hour before and after meals (tea blocks iron absorption). Choose legumes, nuts and seeds in order to boost the iron and protein content of your diet. Choose wholegrain or wholemeal breads and cereals as these often have higher levels of iron and zinc in them. Try to mix in sources of vitamin C with your meals, such as tomatoes, chilli’s, capsicum, cumquat, lime/lemon or any fruits. This will help your body absorb the iron it needs. Choose a rainbow of fruits and vegetables to eat each day to get a mix of nutrients. How much should I eat each day? For vegetarians, use this list as a guide to how many servings of each food groups you should be eating daily to maintain a healthy diet. Vegetables and fruit provide carbohydrate, fibre, vitamins and minerals, they are low in fat and great for you. Choose fresh, well washed F&V. frozen and canned is also a good option. Examples of 1 serving: 1 medium kumala, ½ cup of cooked vegetables or salad, 1 tomato, 1 carrot, 1 banana or ½ cup of fresh fruit salad. These are important for providing your body with carbohydrates for energy and fibre. Also a good source of iron, calcium, protein and folic acid. Make sure you choose wholegrain as they are much better for you than the white alternatives. Examples of 1 serving: 1 medium slice of wholemeal bread, 1 cup of cooked rice or pasta, 2 wheat crackers, 1/2/ cup of cooked oats (porridge). 1 cup of cornflakes. This will provide your body energy, protein and many vitamins and minerals such as calcium and vitamin B12. Examples of 1 serving: 1 glass (250ml) milk, 1 small tub of yoghurt, 2 slices or ½ cup of grated cheese. A great source of protein, fat and several different vitamins and minerals including iron.